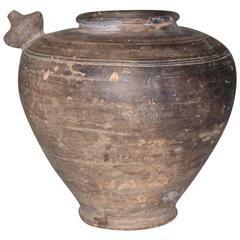 A very fine quality late 19th century medium size terracotta urn or jar with gorgeous original patina. 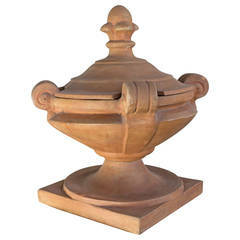 This terracotta storage jar or jardiniere features a lip leading to gracefully shaped rounded belly. The planter is nicely weathered in a red sienna finish. It will be a wonderful addition to any home, garden, foyer or patio. 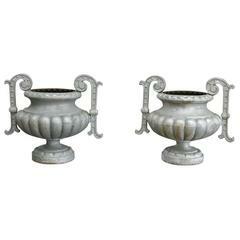 Pair of lovely classical style French urns. Great as centre piece or console piece. Can be sold individually. 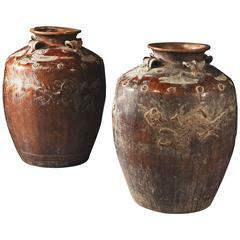 A two handled Mediterranean antique terra cotta olive jar with great wear and classic shape. The matte finish of the body contrasts perfectly with the glazed rim. CR760. Unusual terracotta covered urn, France, early 20th century. Well made and in very good condition.